The Cosmic Puffin festival started in 2008 and wasn’t really supposed to be a festival at all. A close friend of mine had a small daughter taken very ill and spent 3-4 days in a critical condition in St Mary’s Hospital in London in intensive care. A charity based at the hospital provides funds to enable parents of sick kids to stay in lodgings nearby so they can visit easily and regularly. I decided to do a ‘benefit’ gig to raise money for the said charity, COSMIC (Children of St Mary’s Intensive Care). The children’s ward at Basildon hospital where she was transferred to convalesce after coming out of intensive care was called Puffin ward and so the name of the festival was handed to me on a plate! I put the word out to the many bands I knew and have worked with over the years and so many were up for it (about 25 I think) that we decided we had enough bands to make a weekend of it. We started off holding the festival at Easter. On the Sunday morning I staggered out of my chalet after about 45 minutes sleep to be attacked by kids with snowballs! Definitely a first for me at a festival. Those that were at that first one will remember that the snow did not detract from the enjoyment but seemed to make it even more magical. Against all the odds and with only about 100 paying punters we managed to clear a profit of about £1,200 which was fantastic. The second year we added another stage and had about 40 bands in total over the weekend clearing just over £3,500. The charities which we decided to support that year, and continue to do so, were Bliss (for babies born too soon) and the National Autistic Society and we split the money between the two. And so, onwards and upwards, Cosmic Puffin 3 was even better and, although overheads were creeping up, we saw a handsome profit of over £7,500! Cosmic Puffin 4 was a bit of a disaster financially after the success of the first 3 due to a number of reasons and although we didn’t actually lose money we only just covered costs. Putting all that effort in and not achieving anything is very depressing and I was all for calling it a day but everyone else convinced me it was a glitch and that we should do it again. Cosmic Puffin stormed back in 2012 raising £5,000! In 2013 for Cosmic Puffin 6 we supported a new charity ALDLIFE and raised £10,000. This meant we could donate £500 to another local childrens charity: Help Roxi Walk. 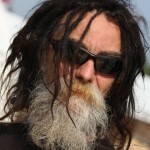 I also personally raised £350 by selling my infamous dreadlocks, which were shaved off at the end of the festival. Cosmic Puffin 7 was the best so far both in attendance and money raised. The total raised, after expenses, was just over £16,000 which is an absolutely amazing amount of money. Who would have thought, after that snowy weekend in March seven years ago, when we sold 112 tickets at £10 each (mainly to my friends), that we would reach these dizzy heights? At Cosmic Puffin 7 we had over 100 bands playing across 6 stages and numerous sets from DJs in the Alice in Wonderland themed dance tent. The kids area is getting bigger and better every year thanks to the tremendous effort put in by Gunpowder Gertie (Gee Gee) and her wonderful Hoi Polloi crew. I’ve always wanted the festival to be kid friendly because I remember, when mine were young, how much fun we used to have as a family with no worries about their safety at Womad and Ashton Court, Bristol. Ashton court alas no longer happens but both of these festivals had excellent kids areas. 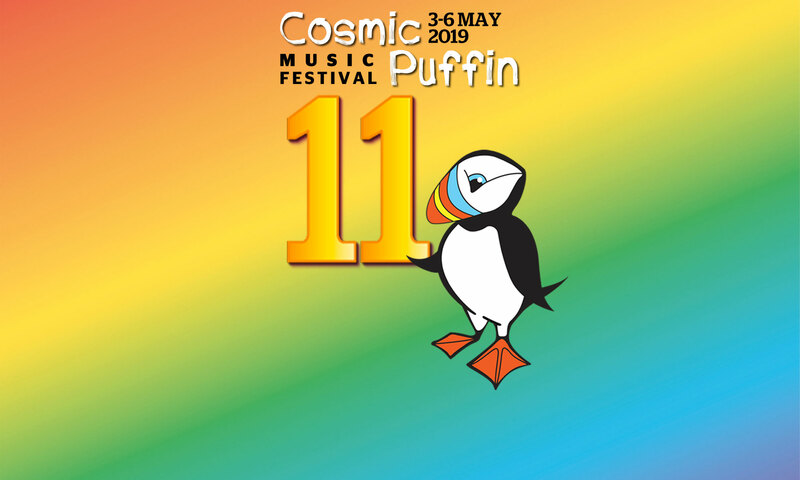 Obviously the festival is mainly about the music and, thanks to the effort put in by Linda and her crew on the Breaking Out stage, Cosmic Puffin gives young, up and coming bands a chance to play in front of quite a diverse audience rather than their mates down the local youth club. Some of these bands are truly excellent and it has become the custom to have the band that impresses us the most to play the 1st slot on my (Cosmic) stage on Sunday evening. Lastly I would just like to thank all the bands who play for free and the many, many volunteers who work all weekend for free, without whom the festival would not happen. That’s it, see you in May.